Even with the best care available, lawns can thin out and lose color due to excessive thatch buildup, too much foot traffic or pet traffic through specific areas that create hard or compacted soils, or periods of high temperature, high humidity, or drought. Aerifying and overseeding is recognized by turf experts such as golf course superintendents as the best treatment to control thatch, helps reduce those compacted areas, fills in bare spots and revitalize growth. Because the aeration process is stressful on lawns, it should only be done during periods just before active growth is expected. For cool season grasses, those typically found in the northern half of the country, this would be in early spring or early fall, the 2 times of the year when cool season grasses really grow. During the hot summer months, cool season grasses really slow down in the growing department and this is not a good time to be aerating. If you're planning on aerating in the spring and you plan on using a crabgrass control product, you'll want to aerate before the pre-emergent application is made, which is as a rule around the time when forsythias first start blooming. You may have heard this term used, but what does it mean. Well, liquid aeration is really not aeration at all, but the producers of the product say their product helps improve soil structure, compaction and drainage without disturbing the soil. The liquid solution is claimed to penetrate heavy clay soil, break apart the bonded clay particles to create a space between these separated clay particles that allow for better water and oxygen penetration. Once the soil is "opened up" an environment is then created that allow microbes to develop do the rest. When you readthe fine print, you'll find that it will take multiple applications for heavy clay and may take up to 6 months or more before you'll notice any difference. Any immediate difference a user might see is most likely due to the increased quantities of ammonium and nitrates in the solution. Should you aerate in sandy soils? Yes, but there is different machinery to be used. Instead of using a machine that pulls out plugs of soil, use equipment that pierces the soil with a sharp spike. This type of equipment is not recommended for heavy, clay type soils as it further compacts the clay. Aeration is a common service provided by most professional lawn care providers. If it's not included in your annual program, they will definitely suggest you should have one because your soil is compacted or it has too much thatch. This may or may not be the case. A reputable lawn care provider will provide you with a core sample from your lawn that clearly demonstrates the thatch layer. You shouldn't have to squint to see the thatch layer as it should be about 1/2" thick or so just underneath the grass and above the dirt. If you have a visible thatch layer more than 1/2" thick, you need aeration and will probably need it for at least 2 years and perhaps twice a year. If you don't have that thick thatch layer, but you haven't had an aeration treatment for several years or more, it would be good to have done. If you just had an aeration last year, and no serious thatch buildup, skip it for this year. 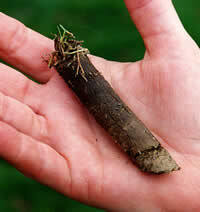 Soil plug with a normal thatch layer at the top.